What happens when you take a perfectly good instrument - one thats been around for hundreds of years - and completely rethink it? 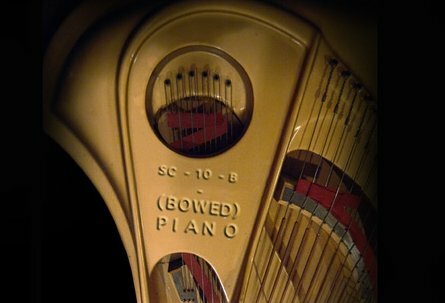 Many musicians have dug their hands into the piano, John Cage prepared it with bolts between the strings, others have strummed it or hit it with their hands, but one of the most ethereal and unorthodox techniques is that of bowed piano. You can see videos of Bowed Piano Techniques on Youtube.. The ultimate pad-sound? Organic, shape-shifting, massive, foreboding yet delicate.. The sound of the Bowed Piano is incredibly versatile very musical and completely unique. It seems to strike a middle-ground somewhere between a synthesiser pad and a stringed instrument and manages to sound like neither. A sound that adds space and movement to a composition, also bringing a magical, shimmering high end and baleful character that evokes so much. First suggested by the composer Curtis Curtis-Smith in 1972, the technique uses flexible bows made from monofilament nylon fishing-line which are then coated in rosin. The nylon is threaded under the strings, and the performer can coax a sustained tone from the piano. Bowed piano has since been adopted and expanded upon by various other composers, including George Crumb and more extensively by Stephen Scott. The Soniccouture Bowed Piano instrument was recorded using a 9 foot Baldwin Grand, a popular model with Bowed practitioners. A matched pair of Bruel & Kjaer microphones were the only choice to capture such a sound. Each key has alternate samples to prevent repetition of attack transients, and there are 3 articulations per key - Normal bowing, Hard bowing, and short, staccato bows. The Normal and Hard samples are looped long, for infinite sustain. When playing, you can crossfade from normal to hard bowing using the mod-wheel, and the staccato bows are activated via a keyswitch.